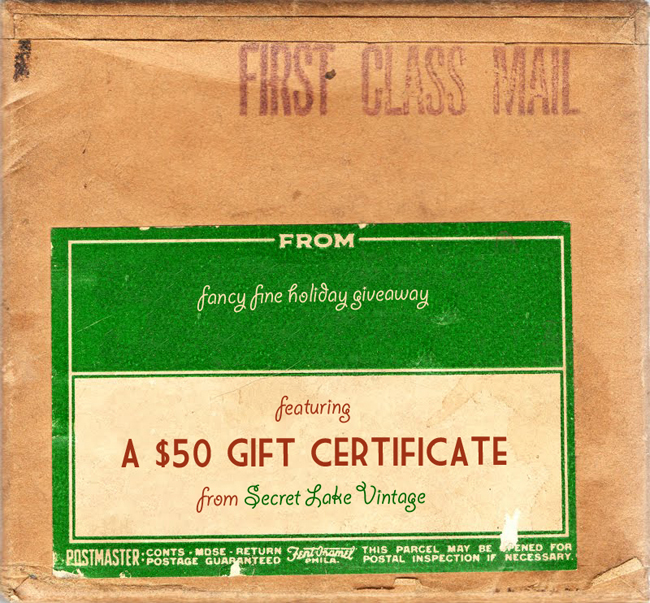 Here it is, the second holiday giveaway... and from one of my favorite shops, Secret Lake Vintage! They are offering Fancy Fine readers the chance to win a $50 gift certificate. And if that wasn't enough they're also offering 15% off any purchase through December 31st using the code FANCY15. I hope someone snaps up this beautiful 1960's cherry red coat, so so pretty! 1) What is the best holiday gift you've ever received? 2) What item from Secret Lake do you covet the most? 3) Your name and email! The deadline to enter is December 24th and the giveaway is open to international readers... good luck! My favorite gift is probably the painting my sister made for me of my pet bird growing up. and my favorite item is the 1970s disco striped dancing dress. I'd never take that thing off! 1. The best holiday gift received (as cheesy as it sounds) was having my entire family together because it's such a rare and difficult thing to do considering all of our schedules and locations. Gage, our puppy... was the best gift I've ever received for Christmas. He was our first gift to each other! Soooo many things are wonderful at Secret Lake, but I just LOVE that Blue Lace Gown. My parents just bought me a new HARP whahooo! I absolutely love this dress!!!! i love the vintage tulip sweater! what do I want most from Secret Lake? that 1960s abstract fitted dress! so many cute things but Im loving the DOONEY & BOURKE vintage purse most. Lets see the best holiday gift I've ever received was my first two wheel bike. It was pink with streamers and had radio that clipped onto the handle bars. It was so cool. My favorite gift is my ipod. The portability of my music has been invaluable and keeps my going day by day. My fave item from Secret Lake is the Vintage Norwegian cardigan. 2. vintage zodiac short brown boots! 1. A hand knitted chevron blanket from my grandmother when I was 12. 2. I love that denim dress and brown leather backpack, Oooo and the velvet satin striped skirt! 1. The best holiday gift I received was my very first camera from my parents. I thought it was the best thing in the world! 2. I would love the vintage icelandic wool sweater. 1. The best holiday gift I received was when I was 13. I told my mom that I really wanted a karaoke machine, since at the time I though I could sing. As my mom started putting wrapped gifts under the tee, I saw a big one and I thought it could be the karaoke machine...unfortunately the tag had my Step Dad's name on it. When Christmas finally arrived, we were all opening gifts and it was time to open the big one. My mom told me to help my Step Dad open the gift, and as the paper started to disappear...inside was a new karaoke machine. My mom had tricked me and it turned out to be a wonderful surprise that I'll never forget. 2. I'm totally in love with the Vintage leather italian made backpack from Secret Lake Vintage. It's gorgeous! 1) Favorite gift is a tie between my first guitar at age 13 and when I got an album of old photos of my super fashionable mother when she was a teenager in the 60s. 2) I seriously drooled a little (gross, but true) when I saw that black velvet Givenchy dress! The best holiday gift I have ever received is my grandfathers health improving and his heart surgery being postponed this December. As material items goes, I recieved a gorgeous reversible leopard swing(ish) coat from the owner of the bar I work at. I love that we have similar style & things in common like the fact that she bought the coat at an estate sale. Plus its just a lovely coat! The item I covet the most would be the 1950s golden suede fur trimmed coat. 1. My favorite gift was a little initial ring from another shop on etsy. 2. I love that tulip sweater! 1. my favorite Christmas gift is a handmade sweater given by my mom when i was 12. it is a wonderful seafoam red acrylic sweater that is so soft and warm. my mom has spend over a month on it to make that sweater looks perfect on me. so that this sweater means a lot to me! it is so unique and you can not buy a similar one in store. 2.my favorite item from Secret Lake is "Hunter Green vintage duffle coat". i actually saw a very similar coat from other store. however, when i saw that coat, it was reserved for someone else. so when i see this amazing coat in secret lake i was so happy that finally i could have it. 1. My new 1970s cruiser bike! Best mode of transport ever. 2. Definitely the 1970s DISCO striped dancing dress. Super cute! My favorite gift of all time was when my best friend gave me a box full of jadeite dishes to start my collection for my first kitchen. She has impeccable taste and owned an antique store so it was perfect! I love that red 60's coat, the collar is so great! And the grey and brown rothschild coats are also fab. 2)I absolutely fell in love with the 1950s light gray wool coat! 2) I'm obsessed with the 1950s Leaf Print Mustard Yellow Dress! So cute! It's so hard to pick a favorite gift EVER, but most recently I loved my flipcam the most. I am dying over the brown trotters oxfords and the 70s floral mini dress...so so perfect! I would never take them off...how have I never seen this shop before?! The best gift I've ever received was a set of homemade day of the week pillowcases (since I'm slightly neurotic about changing my pillowcase). And the 1970s Hippie polka dot dress is perfect! 1) I received a stuffed moose plushie when I was eight. It was definitely not the most expensive or the most thoughtful gift I've ever gotten, but I loved that moose. 2. I love the vintage 1970s honey brown LOAFER heels! From Secret Lake Vintage, I love the bohemian light brown strappy sandals! I had a similar pair from Spain that fell apart in August after a few years of love, so these would be a great replacement! 2. I'm sort of frothing at the mouth over the woven brown oxfords. (They're my size too). ! 3. Would love to receive an email from you: margeincharge(at)gmail(dot)com. Thanks a mil for hosting this giveaway! 1. I have to pick two things for best holiday gift. One is a vegetable garden in the backyard. The other was a vintage Schwinn bicycle. 2. I am in love with that darling grey rothschild coat! I'd pair it with pretty tights and maryjanes. 1. My favorite Christmas gift is a silver ballerina necklace my grandmother gave me when I was 9, the torso and the legs are two different pieces joined together like a chain so she can move as if she's dancing. Hi! Such a fantastic shop! My favorite gift of all time was a letter from my boyfriend apologizing for something wrong and making me a promise that he haven't broken. The most coveted thing is the 1950s LEAF print mustard yellow dress.